General Sedki Sobhi appointed Egypt's armed forces chief and defense minister, a day after Abdel Fattah el-Sisi resigned. Egypt's new armed forces chief and defense minister was sworn in on Thursday, a day after Abdel Fattah el-Sisi resigned so he could stand for the presidency. The BBC reported that Egypt’s interim president Adly Mansour confirmed General Sedki Sobhi's appointment at the weekly cabinet meeting in Cairo. 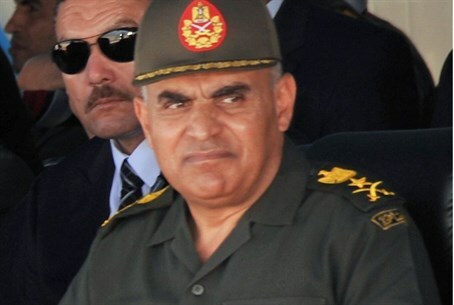 General Mahmoud Hegazi was named the army's new chief-of-staff. Sisi, who held the rank of field marshal, reportedly turned up at the cabinet meeting in civilian clothes. On Wednesday, Sisi announced his plan to run for president, saying it would be the last time he wears his military uniform. “I give up the uniform to defend the nation,” he declared. In his speech, he reminded Egyptians of the security and economic challenges facing them, noting that he cannot “perform miracles” and calling on Egyptians to work hard to improve their country. The 59-year Sisi played a key role in the ousting of Muslim Brotherhood President Mohammed Morsi last year. Since Morsi was ousted, more than 1,400 people have died in street clashes, and thousands have been imprisoned. The Muslim Brotherhood has been outlawed and has been designated as a terrorist organization by the army-led government. The Brotherhood voiced its opposition to Sisi’s bid for the presidency, saying he was not a suitable candidate. "He led a coup to become president. He is a man who has killed daily since the coup," the Brotherhood's political bureau member Ibrahim Munir said. Sisi is highly popular among Egyptians and he took the approval of the constitution back in January as a vote of confidence for his presidential bid.